Mr Sun Lai Fong's awe-inspiring rise from penniless foreign worker to millionaire boss was capped off in the swanky surrounds of the Ritz-Carlton hotel last night. Arriving in Singapore 32 years ago, Mr Sun slogged away at construction sites in the sweltering heat every day. Last night, the 58-year-old chairman of construction firm Sunhuan Construction was honoured as the overall winner of this year's Established Entrepreneur of the Year at a glitzy event co-organised by the Association of Small and Medium Enterprises and the Rotary Club of Singapore. The award recognises owners of small and medium-sized businesses who have excelled in the management of their firms. Mr Sun's story reads like a modern rags-to-riches fairytale. He left his home town in China's Fujian province in 1981 at the age of 26 to make a living in Singapore. The eldest child in a poor family of eight, he sought a better life to support five siblings and his ageing parents, and was armed only with a basic education. 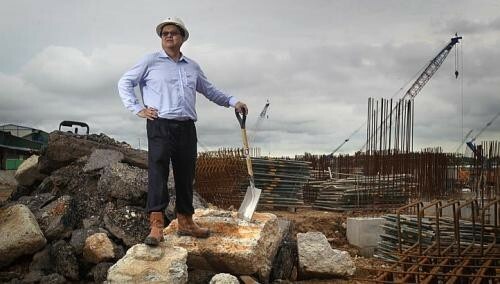 He had been an apprentice construction worker back home and found a job in fast-industrialising Singapore in the 1980s. Life was not easy. The young man earned just $13 a day or $400 a month for his back-breaking toil. "I had to persevere. There was no chance of giving up," he told The Straits Times in Mandarin. His family was depending on him. But he was determined to prosper. He took night classes to upgrade his skills and rose up the ranks to the position of foreman. He struck out on his own in 1991, using $4,000 of hard-earned savings to set up his company. Starting with only eight foreign workers doing steel structure work sub-contracted to him by a friend, he built a reputation for being punctual and responsible. His firm garnered more and more jobs, moving from sub-contracting to main contracting work, and now does mainly Housing Board jobs. Sunhuan currently has six HDB projects - including four in Punggol - to construct more than 5,000 flats. The firm's turnover this year has exceeded $200 million and it employs some 700 workers, including 500 foreign workers. "They live in much better conditions at the dormitories now than I ever had. Back then, we slept at the construction sites we worked on," Mr Sun said. Having experienced the hard life as a foreign worker, he makes it a point to address their complaints and treat them well. Even as a boss, he faced hardship. During the Asian financial crisis in 1998, he went to a construction site to ask a sub-contractor to pay back $40,000 he owed. The angry debtor flung a chair at his head, leaving Mr Sun with blood trickling down his face and cuts requiring hospital treatment. He recalled: "It's a difficult path being an entrepreneur. I was only asking for money that was due so I could pay my workers their wages but I got hit instead." Now a Singaporean, Mr Sun said his rapid rise has not changed his approach to money. Dressed simply, he said: "The only branded things I wear are what my wife buys for me." But he is enjoying the trappings of success, living in a landed property in Seletar and driving a Mercedes. Twice divorced and married a third time, with five children, he said the journey has been exciting. "I never dreamed any of this could happen when I came here. I just wanted first to make a living and then to run my business well," he said.